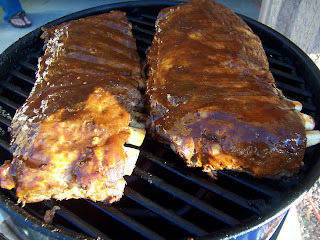 A rib newcomer last summer, I tried a recipe with rave reviews from Epicurious. This summer, emboldened and experienced, I think my adapted recipe is the one. Meat that falls off the bone, do-ahead ease and complex, smoky BBQ flavor. These ribs quite possibly were the best part of our Memorial Day barbecue, unless you count an adorable infant sleeping on my living room floor, my boyfriend and some of my very best friends in the world at my house for conversation, lots of great food & cocktails or an incident that we learned after we ate involving the guys dropping meat on the garage floor. We're still alive after eating the garage-floor meat, and I can say this rib recipe is one of the best. Preheat oven to 250. Mix dry ingredients for rub and spread over all sides of rib racks. Place in large roasting pans, pour beer evenly in both pans (or in one if you have a large enough pan), cover tightly with foil and bake for 2-3 hours or until the meat is fork-tender but not quite falling off the bone. Chill or let stand at room temperature if grilling right away. For sauce, combine all ingredients in a saucepan and reduce until desired consistency. Adjust for flavor. 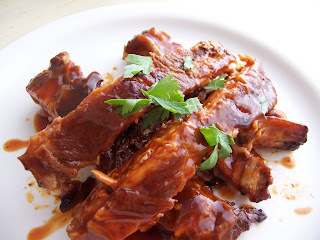 Both ribs and sauce can be made a day ahead of time and chilled until serving. To serve, heat a grill. Grill ribs on both sides, basting with BBQ sauce, until heated throughout, caramelized and brown. 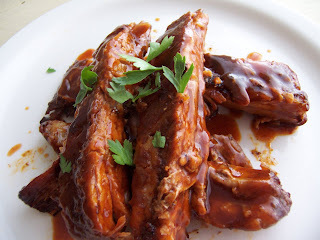 Serve ribs immediately with extra warm sauce for passing at the table. I really want to expand my rib making and I'm so glad you are giving me even more reason to try! 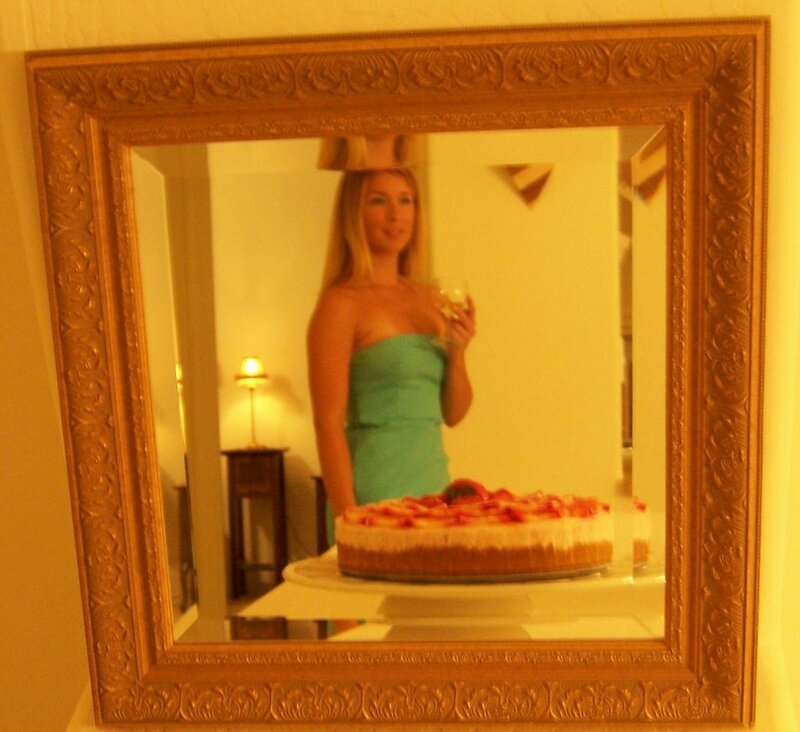 Kirsten, sounds like you had a fantastic Memorial day and the ribs were just the icing on the cake! Wow. These sound fabulous, garage floor and all. I love that you baked them first. 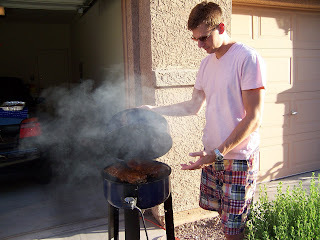 I've never really made my peace with grilling--I do grill on occasion, but never feel that I'm really in control. This method takes advantage of the benefits of grilling [mainly that smoky flavor] without making the grill do all the heavy lifting. And thank you, Freya, for that lovely mental image of meat icing. Yum. Sounds a memorable Memorial Day gathering! Good pals, good food, good talk! Those ribs look awesome! I bet my hubby would really enjoy those. Hi Lis! Thanks!! :) This recipe is so easy and fool-proof, I highly recommend it. LOL @ Freya re: icing. Terry, that was hilarious about the visual. Totally gross. This recipe allows me to master the grill. I too dislike the variances of grilling, so this is a perfect combination. Mmmm, ribs. 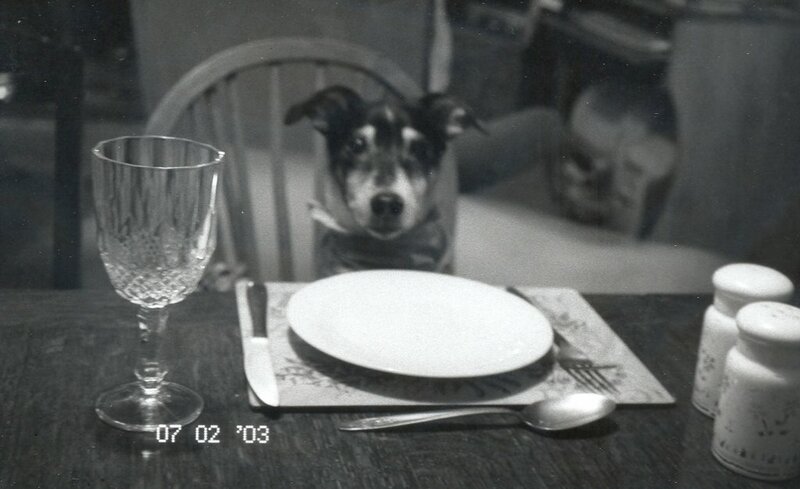 When I am at home with my parents it is the meal I always ask my mom to make for me. These look awesome. Your memorial day weekend sounds like it was picture perfect! Even with the garage floor ribs, they sound delicious!